Since I had such a great time at the tastings at other Kinka Family restaurants, I was happy to be invited to Kintori Yakitori. I mean....who doesn't love food on a stick?! It is located above Kinton Ramen, just east of Christie Station on Bloor. It's got lots of seating in booths or at the bar that overlooks the kitchen. The bathroom is kind of hidden, you just push on the wall until you find the door. Heehee. 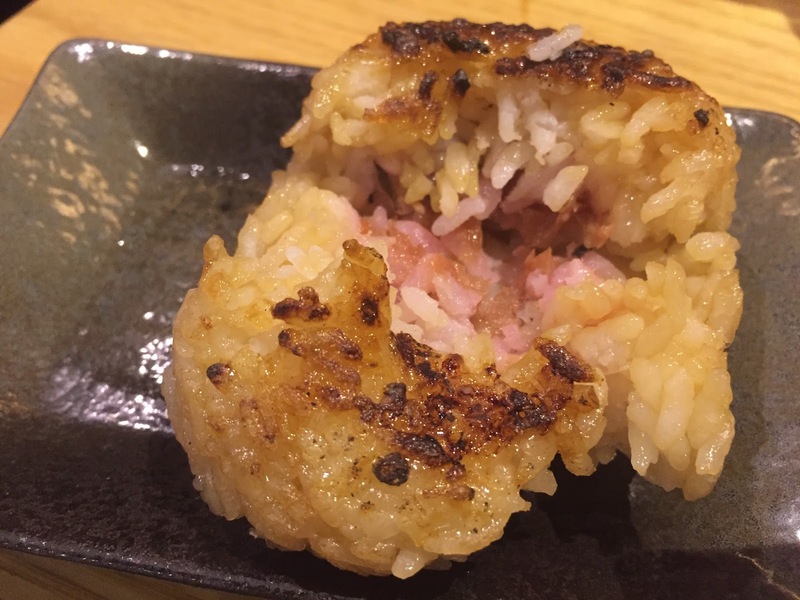 Luckily, if you have any accessibility issues, you can order Kintori Yakitori food from the ramen place on the main floor! And if you get a ramen craving while upstairs enjoying yakitori, you can order there as well. Win! 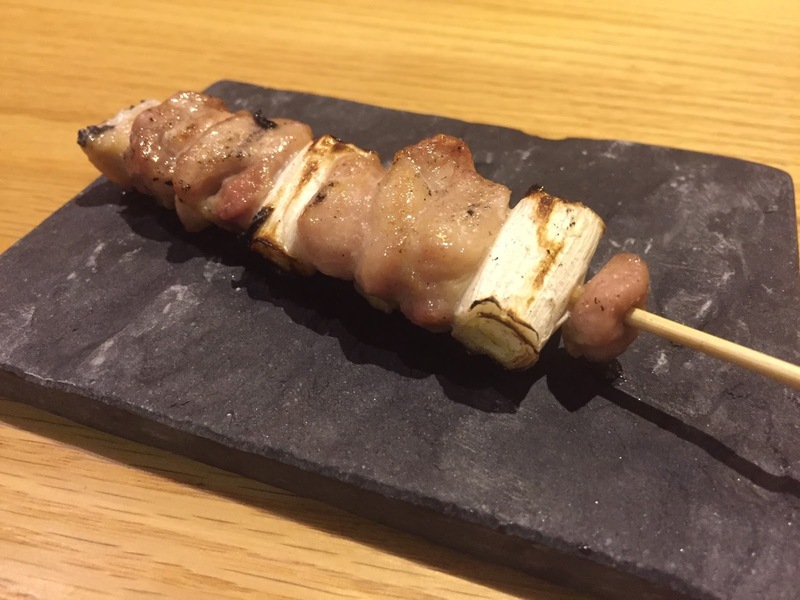 The skewers and charcoal are imported from Japan and you can absolutely taste the difference. It has a menu with lots of variety, for those adventurous or not. There were some foods at this tasting I had never had, but I tried everything! We started with Chicken Original Soup and Oshinko Moriawase. A delightful chicken broth soup with scallions. It was perfect for a cold day. The spoons they gave us were so cool, I wish I'd got a photo. 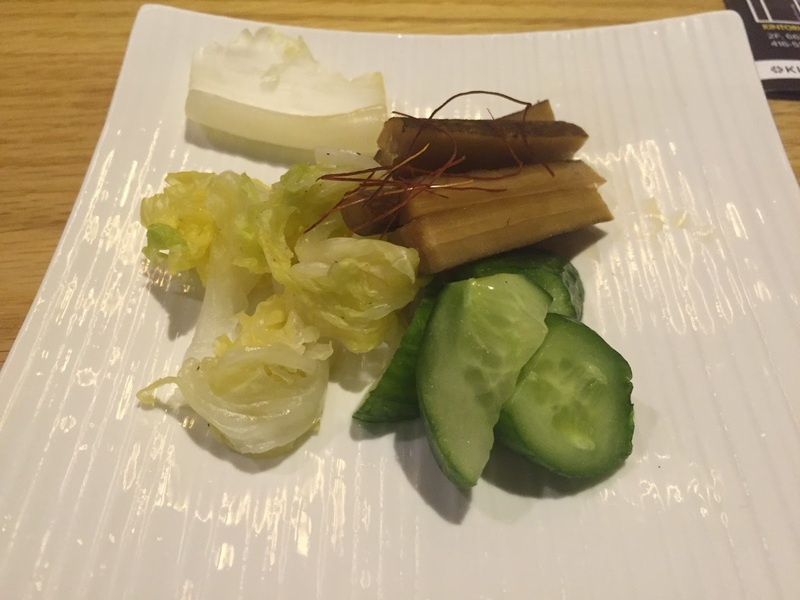 The second appetizer were assorted homemade Japanese pickles. There were 2 varieties and they were crisp and delicious. The cucumber pickles were sweet and the other were more...ummm...for the lack of a better word...branch-y. I'm not sure what veg they were, but I ate them all! Next up was our first foods on a stick. Negima(chicken thigh & tokyo scallions) and Zuri(chicken gizzard). 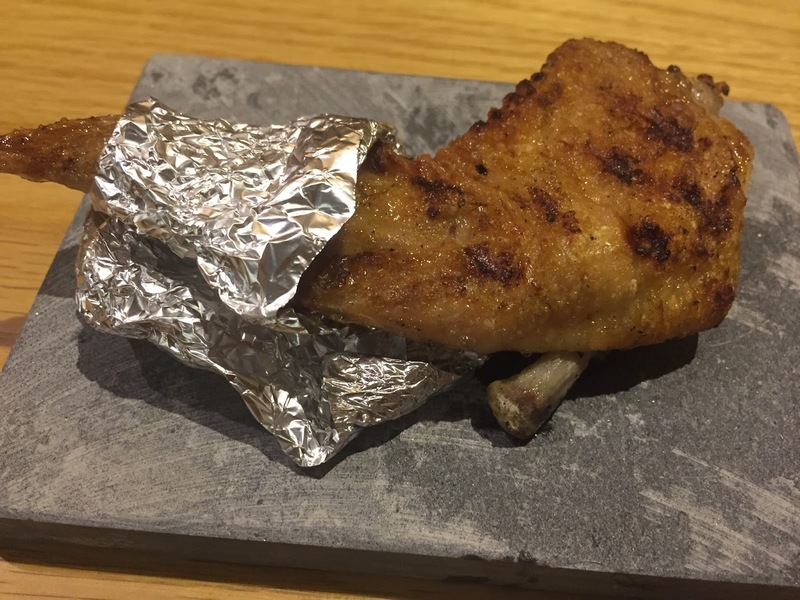 The chicken thigh was tender, juicy and let the charcoal flavours shine. I will order this when I come back. Yum! Ok, so now for the chicken gizzard. It was a little chewier than I'd like, similar to steak grizzle, but not quite that tough. Other people there loved it though. They made me feel like a newbie! The Nikumiso Kyabetsu(cabbage salad) and Tebasaki(chicken wing) arrived. The salad came as cabbage leaves with housemade chicken miso dip, it was a nice light course. We needed one like this, there's a lot to go! 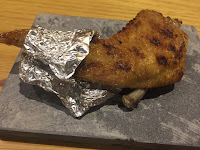 Then it came...the best chicken wing I have EVER eaten. If you order anything when you're here you ABSOLUTELY MUST order this. It's crisp, juicy, flavourful and the charcoal strikes again. I cannot say enough good things about this chicken wing. All you could here was Mmmmmmmm collectively over the whole crowd. 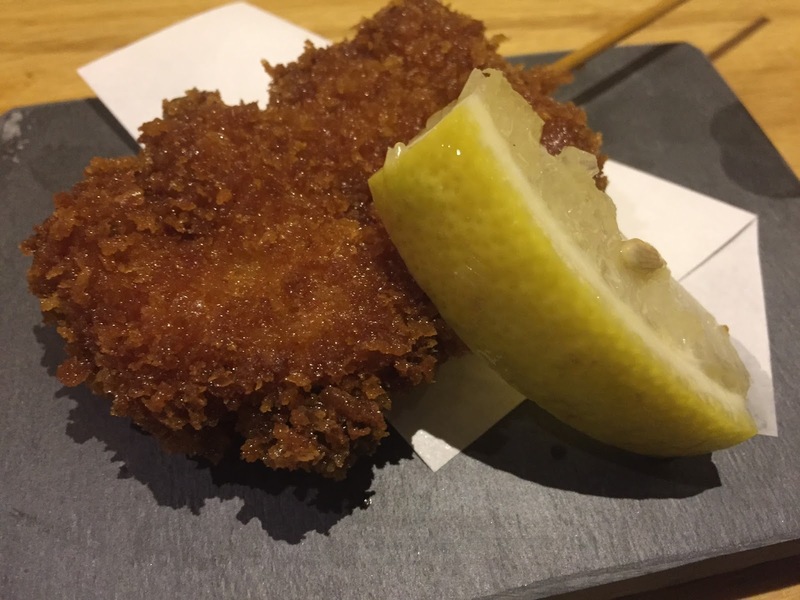 Back to food on a stick with Uzura Kuchi Age(panko breaded quail eggs) and Premium Gyu-Tongue(beef tongue). Some more new things for me to try. The deep fried eggs were really good! A little greasy and not too eggy. The panko breading was perfect. The beef tongue tasted beefy and was slightly chewy, just chewy enough to let you know it's not regular beef. It was quite tasty. Still more to come, we were given Tsukune(chicken meatballs) and Hatsu(chicken hearts). The meatballs were great, nice seasoning and that charcoal flavouring just makes everything even better. 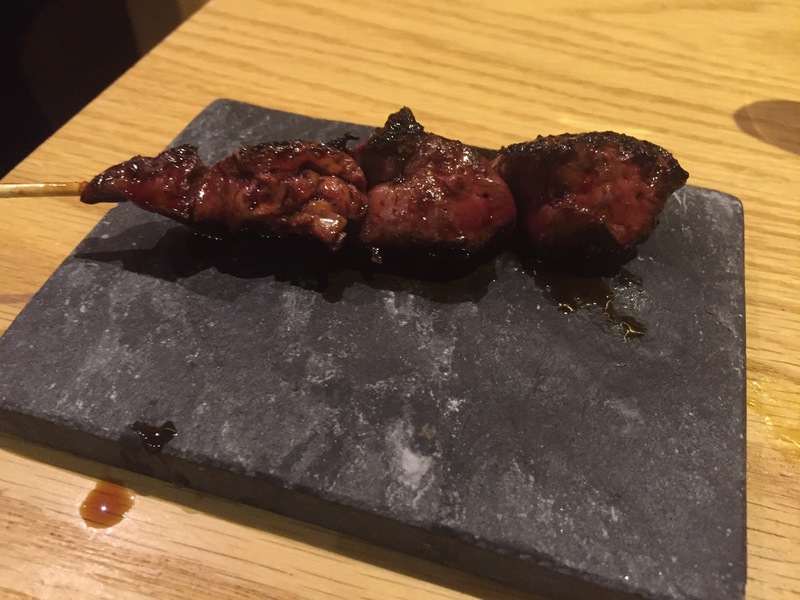 Chicken hearts were not what I expected. They were meatier than I thought they would be. Had the chicken texture, but didn't taste fully chickeny. It's hard to describe. Again, everyone loved them! 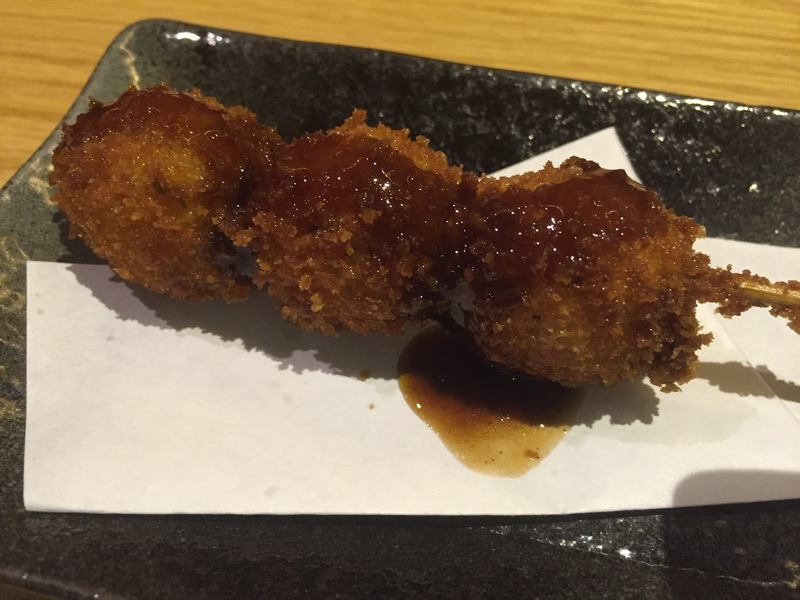 Time for Reba(chicken liver) and Asparagus(deep fried, panko breaded wrapped in bacon on a stick). 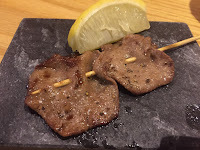 I've had beef liver before, so that's what I expected it to be like. 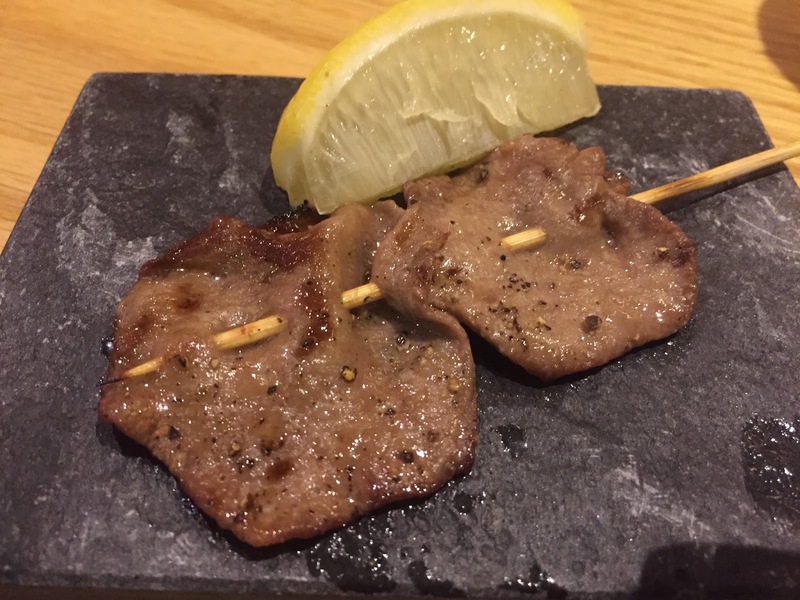 The flavour was quite similar to beef liver, but the texture threw me. It wasn't as firm, not mushy though. The asparagus was a little greasy and I didn't really notice the bacon. The panko gave good flavour and the asparagus was cut in perfect, bite-size pieces. You really CAN put anything on a stick! From here, we received Negi Shio Gyu(beef with scallion sauce) and Dashi Maki(Japanese omelette). The beef was tender and juicy. The scallions gave it a great flavour and they did not hold back on them. The egg was ok. Not special after all of the other dishes we tried. At this point we were so full and we still had dessert coming. Oh my stretchy pants! For dessert, we had Yaki Onigiri(rice ball with plum) and Houki Cha Brulee(green tea crème brulee). The rice ball was too heavy a dessert after that tasting. I could only eat a few bites. The plum was sour and the rice was crunchy. Never had a dessert like this before. 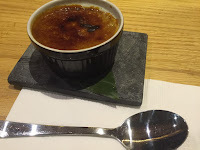 The crème brulee was perfect. Usually, the custard only has a hint of its flavouring, but this tasted just like green tea. The great finish. The staff here, and all Kinka Family locations, are friendly, welcoming and provide great service. They're happy to answer any questions about the food. I will be back to this location to get more chicken wings and taste more of their menu.